This is the latest entry in our On the House spotlight series. Our past spotlights featured TSAHC staff members and partners to help readers get to know our organization and industry a little better. But this week, we are turning our focus to a development financed in part by TSAHC’s Texas Housing Impact Fund. We think spotlighting affordable housing developments across the state will help readers understand what they look like, how they are financed and who lives there. 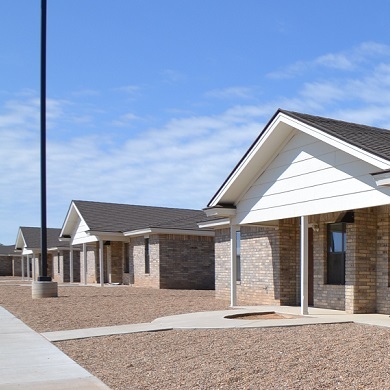 The Vista Rita Blanca Apartments, developed by Guadalupe Economic Services Corporation, include seven fourplex apartment buildings (28 units total) of rural affordable rental housing targeted to agricultural workers in Dalhart, Texas. Located in the northwest portion of the Texas Panhandle, Dalhart primarily relies on agricultural production, processing facilities, and wind farm maintenance for economic activity. Total development costs for Vista Rita Blanca were $3,132,430. TSAHC provided a $356,125 construction loan through the Texas Housing Impact Fund that was combined with $2,686,430 from the U.S. Department of Agriculture (USDA) and $196,000 from the Federal Home Loan Bank to finance the development. The median household income in Dalhart is $47,724. Rents at Vista Rita Blanca range from $637 to $781 per month for two to four bedroom units. The majority of the units (22) are for households earning 60% or below area median income, and the remaining six are for households earning 30% or below area median income. As noted above, TSAHC provided financing for Vista Rita Blanca through our Texas Housing Impact Fund. Financing the development of rural rental housing is also a targeted housing need in our Multifamily Tax-Exempt Housing Bonds program. Moreover, TSAHC is committed to preserving rural rental properties financed by the USDA. Texas is home to nearly 700 rural multifamily developments that were financed by USDA under its Section 514 and 515 loan programs. Many of these developments face uncertain futures because of the need for repairs, maturing mortgages, or expiring rental assistance agreements. TSAHC is partnering with the Federal Reserve Bank of Dallas, Enterprise Community Partners, the Rural Rental Housing Association of Texas and Motivation, Education, & Training, Inc. to launch a Rural Housing Preservation Academy in January 2018 focused on preserving these USDA properties. We encourage you to visit the academy event page for more details and registration information.